Get your calcium & your buzz-on at the same time. Yum. Every parent has swigged the last of their kids’ milk, juice or soda. But very few add liquor, mix it up and tell their friends about it. That’s what Newport Beach, Calif., mom Tracy Reinhardt, 38, did one night after mixing her kids some chocolate milk and putting them to bed. Friends noticed and left a stream of positive comments and questions. Nikki Halbur, 36, of Gilbert, Ariz., was particularly intrigued. The two had attended high school together in Southern California, and Facebook brought them back together. The posting made them business partners. 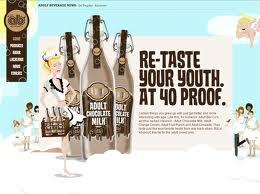 In 2009, the two launched Adult Beverage Co., makers of 40-proof vodka-based Adult Chocolate Milk and soon-to-be-bottlers of Adult Orange Cream, Adult Fruit Punch and Adult Limeade, scheduled to launch May 1.